episode twenty . . .
What a St Paddy’s season this year! 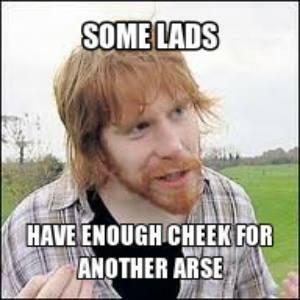 Great craic! Just the way we like it this time of year! So, you see, the Dossers can be seen—everywhere! And in person, too, as we are booked for the second year in a row to play the annual banquet of the Berkshire County Irish-American Club! 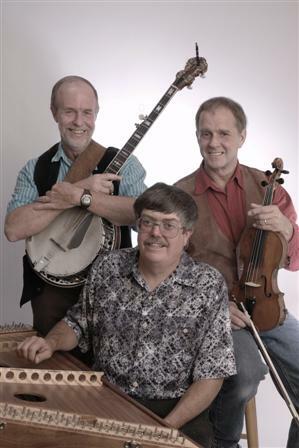 This very weekend, Murray will be presenting our friends, the Rakish Paddy band, with Perry Daniels and Eileen Markland, on Fri Mar 7th and Sat Mar 8th! And we have a brilliant schedule of the Berkshires’ finest live music acts coming up soon on this website, including the likes of the Malibu Bros, the Jeff King Blues Band, (not to be missed!) and singer-songwriter Robin O’Herin—the “Bonnie Raitt” of the Berkshires! 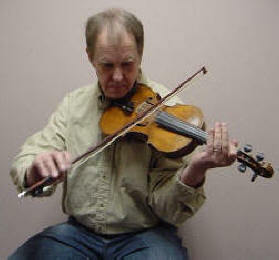 with whom Paul sings and plays fiddle and electric guitar! And hope to give the other two bands their own featured artist slots at other times later in the year—otherwise, it’s not possible to do justice to all the fine musicians involved. The Housatonic River, of course, is our Mississippi, as it wanders and winds its meandering way all through Berkshire County and down through Connecticut. In fact, it goes directly past my house, on the so-called “West Branch” run, down from Lake Pontoosuc, right across the road from my all-weather wrap-around deck, such that I see the river every day as I perform blog duties and record and edit music in my house—I love it! I’m in the city—but right on the urban edge–not more than 1 mile away from open country! As you can readily tell, this band is not your garage-grunge hoot-n-holler wild-bunch Irish pub-crawler group! In other words, ¬not the Dossers! My band is a good-time-music sing-along outfit. Housatonic Philharmonic invites you to an evening in the 18th century, in the drawing room of an aristocratic home on an estate in the Irish countryside—Turlough O’Carolan wanders in with his harp to entertain the young ladies and their beaus, while their parents keep a watchful, but kindly-disposed, eye on the proceedings—and the entire room is wafted away on strings from heavenly choirs! Who was this man? Obviously he has profoundly influenced Housatonic Philharmonic—as he has every generation of the folks who treasure Irish music since the days when he walked the earth himself. Turlough O’Carolan, was a blind Irish harper, composer and singer whose great fame is due to his gift for melodic composition. He is considered by many to be Ireland’s national composer. O’Carolan was born in 1670. He lived at a time when the Irish language (aka Gaelic) was still spoken as the everyday communication-coin of the country. Although he died in 1738, his music will live forever. I myself years ago taught myself to play his composition called Carolan’s Concerto on my old 1956 Excelsior squeezebox—as I remember, I got it from the radio, or a record, and learned it by ear, without sheet music. Often I used to sit by myself and play this just for the enjoyment of the sheer, exquisite beauty of the song—as well as the pleasure of tripping your fingers over the keyboard on the rather complicated sequence of notes. I would play it twice or thrice testing myself to see if I could get through it without mistakes, while yet giving it the lilt and feeling of this emotional piece—the rise and fall of it. I did not know at the time that it was originally a harp piece, for strings. Or that someday I would meet Paul Rice. Paul Rice remains today the only person I’ve ever met who knew that tune by heart and could sit with me and play it on the fiddle, note for note, while I played all the same notes on my box. A moment to live for. I never made a recording of that. Wish I had. Carolan’s Concerto . . .
What, or who, could follow that? And what would St Patrick’s be without a jig or two? BTW– both of Paul Rice’s Irish bands are booked for St Patrick’s weekend this year, at The Olde Forge in Lanesboro. 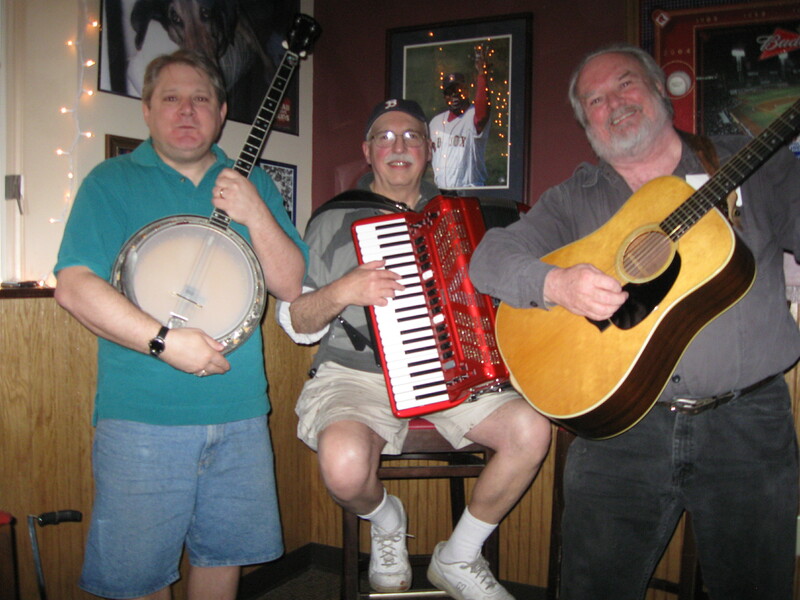 On Saturday night, the 15th of March, you can hear Dublin Porter from 7 – 10pm, and on St Patrick’s Day itself, Monday, the 17th, Housatonic Philharmonic will be playing, both afternoon and evening. Here’s the schedule for the lads the rest of the year – – so far! April 26, Fri., Private Fundraiser with Square One, Greenwich, Ct.
August 18, Sun., Lions Den , Red Lion Inn, Stockbridge,Ma. During the course of the rest of the year, we shall be featuring Dublin Porter, Spurs USA, the Jeff King Blues Band, the Malibu Bros, Robin O’Herin, Patrick Gray and many more! 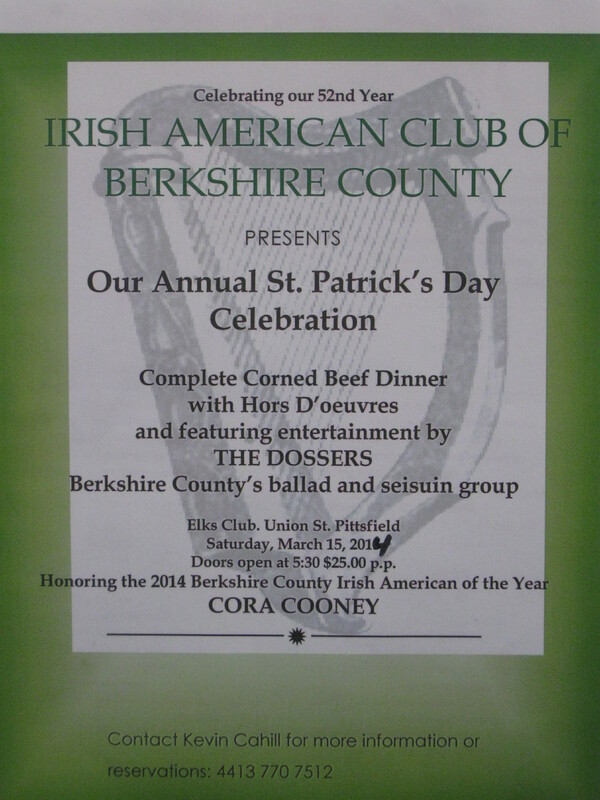 Saturday Mar 15th for the Irish-American Club Annual Dinner at the Elks on Union Street in Pittsfield. Doors open at 5.30 pm Hors d’ouerves at 6 – dinner, music and The Dossers to follow till 10 pm___for your Irish musical listening and dancing pleasure . 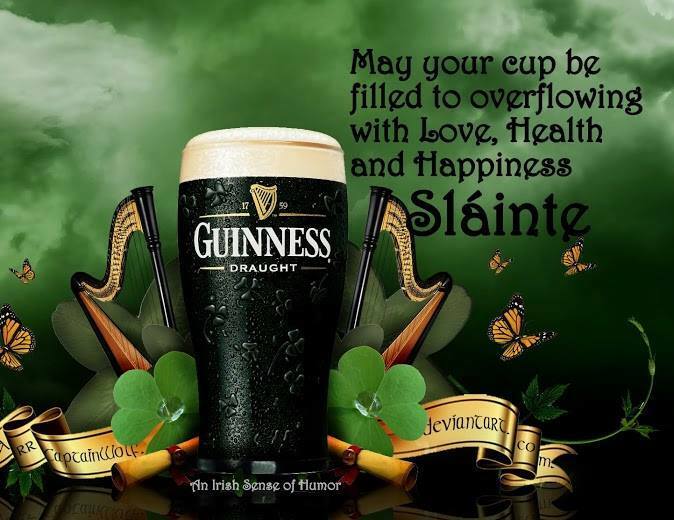 . .
And on Monday the 17th, St Paddy’s Day, we’ll be at PORTSMITT’S LAKEWAY RESTAURANT, corner of Peck’s Road and Valentine Road, in Pittsfield, from 4 – 7p and beyond, as long as they can stand up! As well as in Great Barrington, on Wednesday, Mar 12th, 11a – 1p, for the Italian Club’s luncheon—and we promise to do some Irish there as well! As they say in Italy – – Ciao! And in Ireland – – Slan! none other than THE DOSSERS !! !